Are you in New Jersey, or know anyone there? Slate the date and enjoy art! 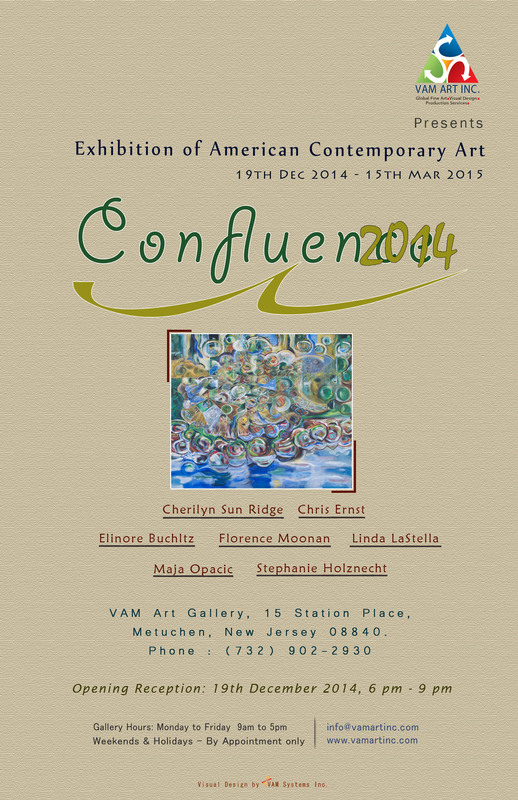 Opening Reception 19 December 2014 in Metuchen, New Jersey, for CONFLUENCE 2014–An Exhibition of American Contemporary Art. This promises to be a gorgeous show. I have three pieces, and am thrilled to be in such esteemed company, and at a lovely gallery whose owner, director, and manager have been nothing but kind in our interactions. 19 December 2014, 6-9 pm, VAM Art Gallery, 15 Station Place, Metuchen, New Jersey (732.902.2930). CONFLUENCE 2014 will be hung 19 December 2014 – 15 March 2015.
preparation for Solstice and new ways. Love&Light from Raven and Me. Big 500, People’s Art of Portland is coming in December. These are my five little pieces. All work is a uniform 8″x8″ and every piece sells for only $40. More to come on location, dates, times at the gallery.